Take Me to Your Leader is the second studio album by British-American MC/producer MF Doom, released under the alias King Geedorah via Big Dada on June 17, 2003. King Geedorah is the alias MF Doom uses as part of the underground super group Monsta Island Czars. The album features guest appearances from MF Grimm (as Jet Jaguar) as well as other MIC members. The character is based on the three-headed King Ghidorah, a monster who appears in the Godzilla films. Mark Martelli of Pitchfork wrote that Take Me to Your Leader "will excite you in a way most hip-hop projects just aren't able: It's not straining for credibility nor putting effort into being revelatory; it just is." Noel Dix of Exclaim! remarked that the album "plays like a cinematic space adventure that you never want to end". In 2009, Rhapsody ranked Take Me to Your Leader 17th on its list "Hip-Hop's Best Albums of the Decade". In 2012, Stereogum named it the third best MF Doom album. In 2014, it was listed by Complex as one of the "Best One-Producer Albums of the 2000s". Retrospectively, Jacob Adams of Spectrum Culture wrote, "It's perhaps one of the weirdest rap albums of the past decade, yet one of the most endlessly fascinating. It deserves a second listen." All songs written, arranged and produced by Metal Fingered Villain (except for track #1 which was produced with E. Mason); mixed and mastered by King Geedorah. ^ Bush, John. "Take Me to Your Leader – King Geedorah". AllMusic. Retrieved December 22, 2016. ^ a b Martelli, Mark (July 7, 2003). "King Geedorah: Take Me to Your Leader". Pitchfork. Retrieved December 22, 2016. ^ Krolak, Mike (June 17, 2003). "King Geedorah – Take Me to Your Leader". Prefix. Retrieved December 22, 2016. ^ Doggett, Tom (September 28, 2004). 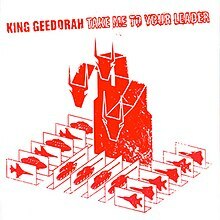 "King Geedorah :: Take Me to Your Leader :: Ninja Tune Records". RapReviews.com. Retrieved December 22, 2016. ^ "King Geedorah – Take Me To Your Leader". Uncut (75): 114. August 2003. Retrieved December 22, 2016. ^ Dix, Noel (January 1, 2006). "King Geedorah: Take Me to Your Leader". Exclaim!. Retrieved December 22, 2016. ^ Tatusian, Alex (December 12, 2012). "MF Doom Albums From Worst To Best". Stereogum. Retrieved December 22, 2016. ^ Drake, David (October 28, 2014). "The Best One-Producer Albums of the 2000s: King Geedorah, Take Me to Your Leader (2003)". Complex. Retrieved December 22, 2016. ^ Adams, Jacob (January 30, 2012). "Rediscover: King Geedorah: Take Me to Your Leader". Spectrum Culture. Retrieved December 22, 2016.